We are now in the sun sign of Aries (March 21 – April 20). Aries is represented by the Emperor in the tarot (Major Arcana, #4)*, and it is the sign that begins the Western astrological wheel. The Emperor is represented by the father and thus represents a sense of discipline and structure. You may find, during the time of this sign, it becomes easier to create a new discipline in your life, or you may find help that comes to you in that form. Certain rules are required for desired outcomes. The keyword for the Emperor is Father; therefore, issues of the father or one’s own fatherhood can be indicated in a reading with this card. 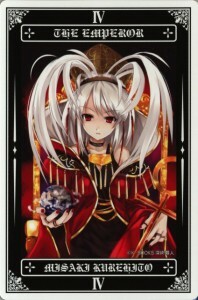 The Emperor by Kurehito Misaki from Kiseki Tarot (Manga Tarot Artbook). The Emperor is an indication of fatherhood, or a father figure. This can relate to “daddy issues” in one’s life whether it is your own father or you as a father. There is a need for discipline and structure because sometimes the Emperor can be “too direct” with his energy and enthusiasm. You should always make sure that you’re not being overly controlling or tyrannical which can happen if the Emperor manifests the shadow side of his energy. This energy can also lead to a lack of self-control or ambition and possibly even run-ins with authority figures. A sense of powerlessness can accompany the negative aspects of this card. You must remember that you have the ability to create order out of chaos by creating, and sticking to, a solid plan of action. aries, astrology, control, discipline, father, Personalities of the Tarot, tarot, tarot emperor, the emperor. Bookmark.